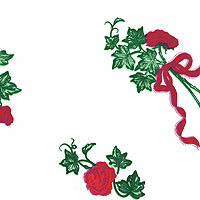 Red Flowers and Bow Cellophane Roll 24 inches wide x 50 ft long. Beautiful red flowers and bow with light and dark green leaves. Pretty design on a clear cello background.